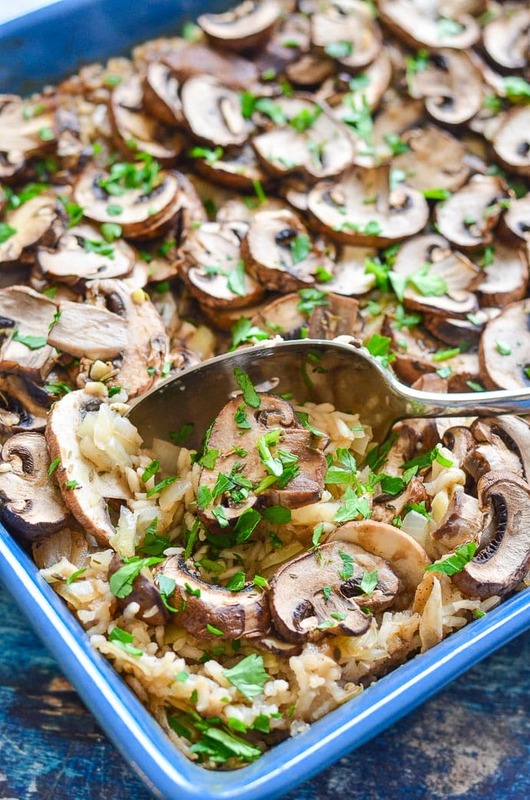 One-pot, Oven Baked Garlic Mushroom Rice. A simple, comforting, no frills kind of meal that you are going to be wanting to make again and again! It’s got a pretty short ingredient list and is really, really easy to make. It is also completely oil-free and gluten-free but still incredibly tasty, pretty budget friendly and really filling (thank you rice!). Yes! Any meal that involves a combo of hearty rice, mushrooms and garlic is a winner for me. I’m still absolutely crazy about my Garlic Mushroom Risotto. It’s so good, but pretty indulgent and plus you have to stand over it and stir constantly while it cooks. 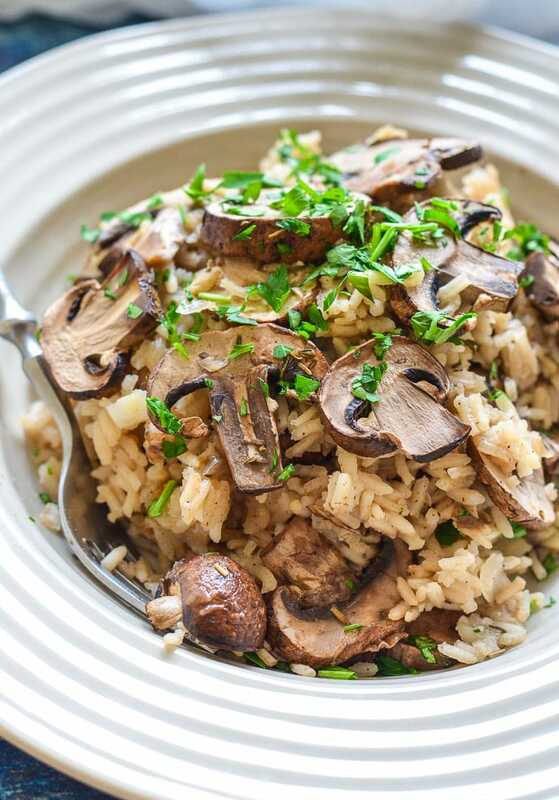 This Oven Baked Garlic Mushroom Rice is a hands off, lightened up, less indulgent garlic, mushroom, rice combo. I am using U.S grown rice in this recipe because it’s about as local as you can get here in Canada. We don’t produce it all so most of the rice consumed here originates from the U.S. I think my family alone keeps the rice producers in business. We eat crazy amounts! Mostly because we love it, but also because it’s budget friendly, versatile and kid (or big kid) friendly. 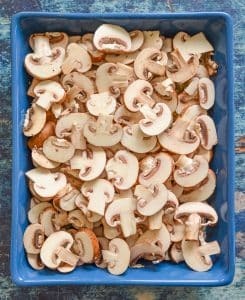 Today it becomes the perfect vessel for all of the mushroomy, garlicky goodness going on in this recipe. Rice win! ???? One-pot meals are where my life is at lately. When I’m busy I love to just throw everything in and walk away and this is one of those recipes. 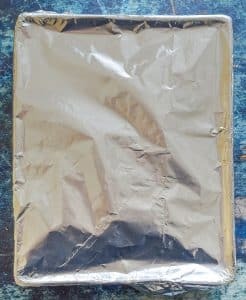 Put everything in a large baking dish cover with foil and bake. Simple as that. Rice is a great base for family meals because it’s allergy friendly, nutritious, low in calories (about 108 calories per half cup serving), naturally sodium free, cholesterol free and it’s a great source of B vitamins, phosphorous, zinc and plant-based protein. 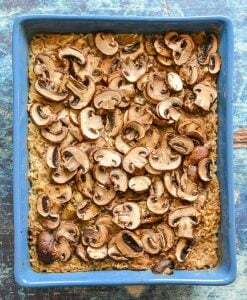 It’s also really easy to cook, especially in this Oven Baked Garlic Mushroom Recipe. 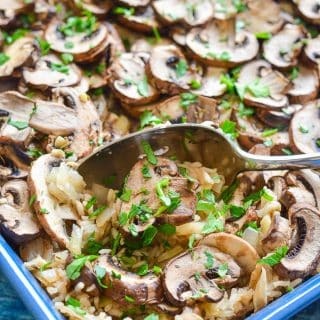 Your oven does all of the hard work and produces a steaming dish full of garlicky mushroomy goodness which is not only vegan, it’s also low in calories, completely oil-free & naturally gluten-free. Plus it’s perfect for those watching their sodium intake. Just omit the added salt and use either homemade broth or a low sodium store bought variety. 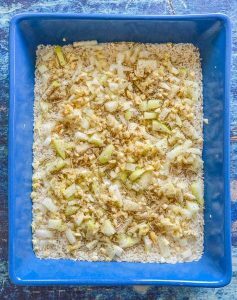 You can make it ahead – mix everything up in the baking dish, cover with foil and pop in the fridge, then you can cook it when you are ready, just be careful that you don’t slop the broth all over the place when you remove it from the fridge. It’s perfect for reheating – take the leftovers to work the next day or double it up so that you have a complete meal ready for the next day. I do this a lot so I can have alternate lazy nights ???? 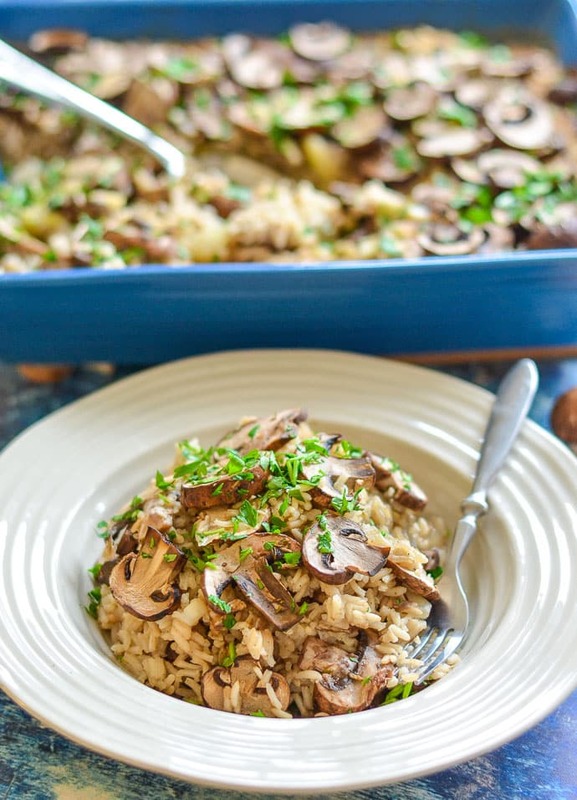 Are you ready to be part of this one-pot Oven Baked Garlic Mushroom Rice deliciousness? You’d be crazy not to so let’s do this! 840mls / 3½ cups flavourful broth , I like to use mushroom broth as it has the best flavour. It must be a good tasting broth as this is where a lot of the flavour will come from. 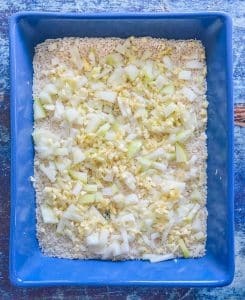 Rinse the rice then place it in a large baking dish. Mine measures 13 x 9 inches****. Add the onions and garlic then the seasoning and herbs. Stir together to evenly distribute then level out. Spread the chopped mushrooms evenly over the top. Pour over the broth then cover tightly with tin foil or a tight fitting lid. Remove from the oven, remove the foil, check the rice is tender. If not give it a stir, cover and return to the oven for another 10 minutes. 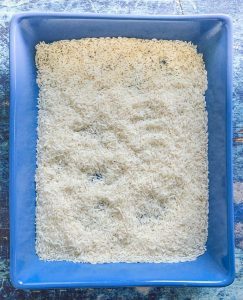 Once rice is tender remove from the oven. If there is any visible liquid uncover and return to the oven for about 5 minutes and it will evaporate off. *Any long grain white rice variety will work including basmati and jasmine. I have not tested this recipe with brown rice. Do not use pre-cooked rice. **I like my rice super garlicky so used 10 cloves. Feel free to lower this amount if you aren't so much of a garlic fan. *** I like the combo of thyme and rosemary. You can use whatever herbs you have available though. Just use a similar quantity. ****My baking dish measures 13 x 9 inches and is ceramic. You will need one of a similar size. Any smaller and it might not all fit in. Bear in mind too that if you use a metal or glass dish the heat will conduct differently and the cooking time might need adjusting slightly. 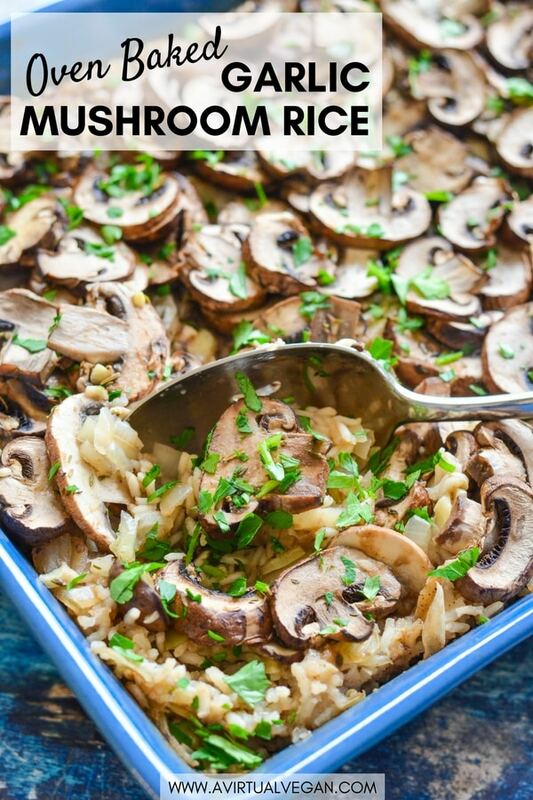 This Oven Baked Garlic Mushroom Rice recipe is sponsored by USA Rice Canada. Thank you for continuing to support the brands who help make this site possible.